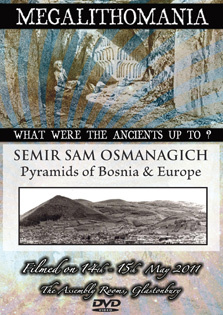 In 2005, Semir discovered the first pyramids in Europe near the town of Visoko, Bosnia-Herzegovina. In 2008, Dr. Osmanagich hosted a archaeological conference in Sarajavo which fueled controversy about his discovery dividing the archaeological community. Excavation on the vast complex has been ongoing since 2006 compiling more and more evidence to validate his claims. To date the excavation has yielded 5 pyramids of various sizes as well as a vast labyrinth of underground tunnels and a pyramid that is 30% larger than the Great Pyramid at Giza. He holds a PhD in Mayan studies and spoke at Megalithomania 2008 when he caused a sensation.